Off screen/onscreen BFF Jennifer Aniston and Courteney Cox are going to share the small screen again in the new season of Cougar Town, as Jennifer is wanted for a cameo on the ABC comedy show. I would love for it to happen but there’s nothing to talk about yet,” Lawrence said. 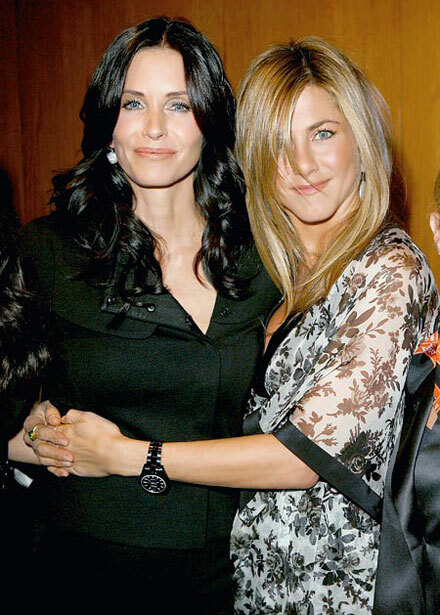 Courtenery Cox has always been pretty vocal about her desire to have Jennifer Aniston on Cougar Town ever since the first episode of the first season of the show. Now as the show has been renewed for season 2, Aniston’s cameo can be expected to bring in big ratings. We’ll see how it works on September 22, 2010. FYI, prior to Cougar Town, Courteney and Jennifer have shared the small screen twice – in Friends (1994 -2004) and in Cox’ Dirt in 2007. Cox’s other Friends co-star, Lisa Kudrow, guest-starred as an angry dermatologist during Cougar Town‘s first season. There’s no word on who Aniston would be playing, EW reported.